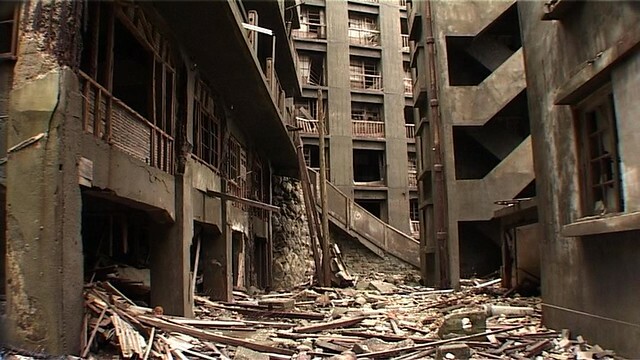 Join us on Wednesday March 28th at the Gendai Workstation, for a film screening of Hashima, Japan 2002 by Carl Michael von Hausswolff and Thomas Nordanstad and a discussion with artist Mitchell Akiyama and scholar Eric Cazdyn, moderated by film programmer Aliza Ma. The screening event will offer a critical point of intersection between the sound installation Seismology as metaphor for empathy by artist Mitchell Akiyama recently on exhibit at the Gendai Workstation, Eric Cazdyn’s essay Semi-ology of a Disaster or, Toward a Non-Moralizing Materialism in Scapegoat journal issue 02 Materialism and a premier of Hashima, Japan 2002. Carl Michael von Hausswolff (b. 1956) is a Swedish audio-visual artist and electronic music composer, who is best known for his sound art works. His most recent CD, 800 000 Seconds In Harar, was released 2011 by TOUCH (London). Hausswolff’s work was included in documenta X in 1997, Venice Biennale 2001/2003/2005 and he curated the 2nd Gothenburg Biennale in 2003 as well as FREQ_OUT at Moderna Museet, Stockholm 2012. Hausswolff lives and works in Stockholm. Mitchell Akiyama is a Toronto based artist, composer, and a PhD candidate in Communications at McGill University. His work explores the history and materiality of sound. He has performed and exhibited throughout North America, Europe, Japan, and Australia in galleries, festivals, and run-down dive bars, the likes of which include the Museum of Modern Art in Vienna, the Sonar festival in Barcelona, the Mutek festival in Montreal, and a former fallout bunker in the post-Soviet squalor of Opava, Czech Republic. Eric Cazdyn is Professor of cultural and critical theory at the University of Toronto. He is the author of the following books: The Already Dead: The New Time of Politics, Culture and Illness (Duke, 2012), After Globalization (with Imre Szeman, Wiley-Blackwell, 2011), Trespasses: Selected Writings of Masao Miyoshi (Duke, 2010), and The Flash of Capital: Film and Geopolitics in Japan (Duke, 2002). Aliza Ma is a fervent cinephile living in Toronto. She has worked on programming for the American Film Institute and Sundance Film Festival, and is now a year-round employee of TIFF Cinematheque, in the film programmes department. She has mediated and translated for Chinese filmmakers, Jia Zhangke and Emily Tang. Independently, she contributes to various film-related publications and works as a programmer for the Gendai Gallery, exploring facets of micro-cinema programming, focusing on the avant-garde and contemporary Asian cinema.